Abstract: Despite the importance of literacy in today’s educational curriculum, learning to read is a challenge for many children with autism spectrum disorder (ASD). One of the foundational skills of early literacy learning is the ability to recognize sight words. 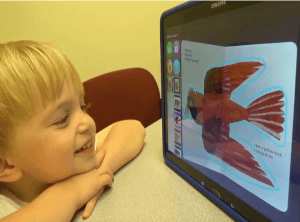 This study used a single-subject, multiple-probe, across-participants design, to investigate the effects of a new software feature, dynamic text and speech output, on the acquisition of sight words by three pre-literate preschoolers with ASD during shared digital book reading experiences. All participants demonstrated successful acquisition of the target sight words with minimal exposure to the words. Limitations and future research directions are discussed, including the importance of investigating how the new software feature can be integrated into a more comprehensive literacy curriculum.